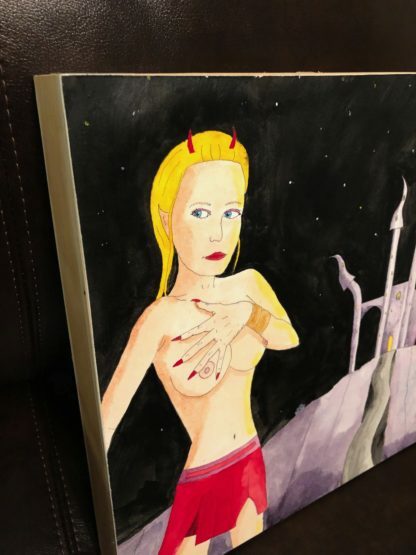 Fantasy pinup art on 140 lb archival quality watercolor paper. Artist used both watercolor and gouache. On wood backing. Ready to hang up. All you need is a hammer, a nail, a wall to put it up on, and of course, the painting. We all know the tale of the succubus – a female demon that slips into a man’s dreams and tries to seduce him. If she is successful, and he dies in his sleep, she gets his soul. A true test for a man. Can he resist her evil lure? But, what if the man is a man of men? Sometimes, it takes two to tango. (Well in this case, three. But I’m trying to use more metaphors). That’s how the great Don Juan fell. And you know what? They gotta live somewhere. Here’s where these two succubi sisters live. In their evil lair. Castle Succubi my friends. Stay strong! Don’t give in to their charms. And Why Are You Wasting My Time?